Melodic minor scales – Repeat the Top Note? Melodic Minor Scales - Repeat or Not to Repeat the Top Note, that is the question. Melodic Minor Scales - Why do we have to repeat the top note when writing an ascending and descending Melodic Minor Scale starting on the Submediant or the Leading Note? As a young Teacher, I was terrified when a student asked me a “Why” question. I was afraid that if I said “I don’t know”, they would think that I was dumb. Now, nothing makes me happier then when a student asks “Why” and I don’t know the answer. Why? Because I get to learn something new! In Theory, there is always a theoretic or pedagogic reason to every “Why”. And I love putting on my Sherlock Holmes hat to discover it. My student Liam is preparing for his Advanced Rudiments Theory Exam. He loves to ask “Why?” questions as he has a passion for knowledge. When writing a Major, Harmonic Minor or Melodic Minor Scale ascending and descending, if the bottom note is the SAME NOTE as the top note, it is NOT repeated at the top of the descending scale. Why? Because it is the SAME note. Liam asked me “Why do we have to repeat the Submediant and Leading Note when writing a Melodic Minor Scale when they are the same note?” Because they are NOT the same note. On Page 21 in the Advanced Rudiments Workbook, we explain how to write Melodic Minor Scales beginning on the Submediant or Leading Note. C natural and C flat are different notes. They are played on different keys on the piano. Why are they repeated when they are both C’s? They may use the same letter name, but they are not the same note. Why? Because they have different pitches. If your student plays a C natural instead of a C flat, you would correct them. Why? Because they are not the same note. In all other scales, the starting note is not repeated when writing the descending scale because it is the same note. 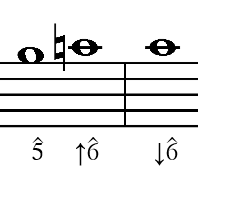 The bottom note and the top note of this scale is A flat. Because it is the same note ascending and descending, it is not repeated. Melodic Minor Scales – So why do we have to repeat the top note when writing an ascending and descending Melodic Minor Scale starting on the Submediant or the Leading Note? Because it is not the same note. I used to feel embarrassed and ashamed when I didn’t know the answer immediately to every “Why” question. And then I realized that if I actually knew everything, I would miss out on the adventure of exploring and discovering new theoretic and pedagogic concepts. Don’t be afraid or embarrassed to share your “Why” questions below. It will give me the opportunity to keep on learning…and I love to put on my Sherlock Holmes hat! P.S. Join the conversation – Enter your music theory "WHY" questions or comments on Melodic Minor Scales below. 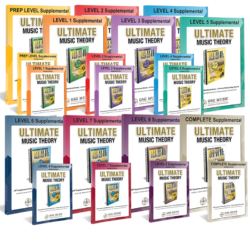 Supplemental Teacher Pack - Includes All 20 Supplemental Books - PREP, LEVELS 1 - 8 and the COMPLETE Supplemental Workbooks and all Matching Answer Books. Why are there perfect 4th, 5th and 8th and not major 4th, 5th and octaves. Good question Kathy . . . I think it has to do with the physics of how the sound waves come together but can never explain it beyond this point. It’s time for Shelagh to put on her physics cap!!?? 1) The most important notes in a “Key” are the Tonic, followed by the Dominant and then the Subdominant. We consider the intervals that use those notes to be “Perfect”. In music, Perfect intervals are more stable, and do not “change” or vary as much as the Major/minor relationships of the 2nd, 3rd, 6th and 7th. In Harmony, using an Augmented Interval (especially the Tritone – the Augmented 4/Diminished 5) is a big “no-no”. 3) Pythagorus, the Greek Philosopher and Teacher, basically established the chromatic octave and stated that the intervals of the P1, P4, P5 and P8 were the most pleasing, the most consonant. The Supertonic, Mediant, Submediant and Leading Note (or Subtonic) notes were more dissonant. Pythagorus was born in 570 BC, and had a huge influence on music and music theory. And yes! That would be reason #4! Well done! A Perfect Interval is the only interval when inverted remains a Perfect Interval for that exact reason. Thanks Deanne! Knowing is different than teaching. I love how musical concepts are made clear so that we, as teachers, can learn how to put our knowledge into concise and understandable explanations. Thank you Shelagh!! During the Middle Ages, Gregorian chant was sung in Unison. When harmonies were added, the ONLY intervals which were allowed by the church were parallel fifths and fourths. This is because music on earth was thought to be a representation of the perfection of God. Fourths and Fifths are perfect 2:3 ratios. Thirds and Sixths were considered unpleasing to the ear, and were actually forbidden by the Catholic Church which sort of makes sense when you consider that a system of equal temperment tuning hadn’t been adopted yet, and seconds, thirds, sixths and sevenths were subject to the problem of the nasty “Pythagorean comma.” Howard Goodall explains this really well in his episode 2 of his documentary, “Big Bangs,” which is available on DVD from the Alberta Piano Teachers Association lending library.